The Spanish Conquest: What Really Happened? Columbus discovered America, Cortés conquered the Aztecs, Pizarro the Incas. Soto had something to do with the Mississippi. And Cabeza de Vaca? Well, your teacher never mentioned him. For most Americans, this is the extent of our knowledge about the invasion of the western hemisphere and subjection of its native peoples by a foreign power. 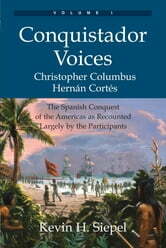 But now you can fill this gap in your knowledge by reading Conquistador Voices. You're likely to find the experience engaging because *Conquistador Voices *is built around first-person narratives. You'll hear what happened from the lips of the foreign invaders themselves and, in some cases, from the people whose lands were invaded--the native Americans. Think of this book as a film documentary in written form, with 500-year-old "sound bites" blended into a smooth-flowing author narrative that refrains from telling you what to think, but rather leaves you to make your own moral judgments. In these two volumes you'll find neither a defense of the conquistadors nor a politically correct polemic against them. 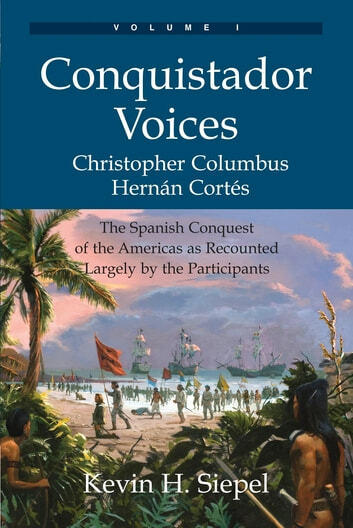 Volume I opens with the four voyages of Christopher Columbus, offering new insights into this man's complex character. It then explores in lavish detail the conquest of Mexico by Hernán Cortés. In Volume II you'll be taken into the high Andes with the brazen Pizarro brothers, into the wilds of Texas and Mexico with Álvar Nuñez Cabeza de Vaca, and along a trail of successive misfortunes--through today's Florida, Georgia, the Carolinas, Tennessee, Alabama, Mississippi, Arkansas, and Texas--with the expedition of Hernando de Soto. Conquistador Voices is a one-stop layman's summary of this epic period, delving into persons and events we still talk about today.